I've recently reviewed Monopoly Here and now World Edition on the iPhone 4 and it was a thoroughly enjoyable board game experience. With crystal sharp graphics thanks to the Retina display, the only issue with this release was that it was a little small. Thankfully EA have released a HD version of the game for the iPad that boasts 9.7 inches of gaming goodness. The other most noticeable difference is multiplayer that is more enjoyable as you can lay the iPad down flat on a table and it's like playing the original board game, minus all the peripherals. In essence, the game is identical to the original board game, however this version is based on locations from around the world as opposed to select countries like the UK or Australia. 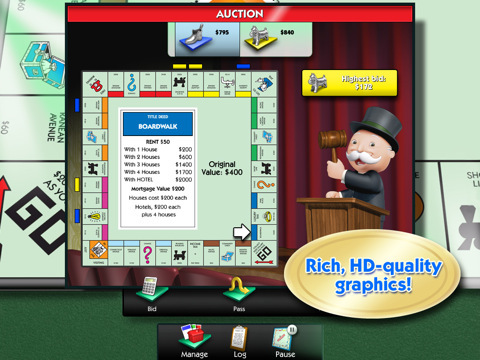 The premise is identical, you pick the numbers of players (AI players are available also), your Monopoly thimble avatar (e.g. ship or dog) and then start playing. 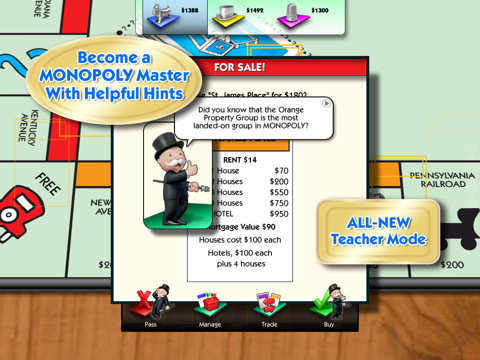 The idea is to purchase as many properties as possible on the board and then populate them with houses or hotels. If a player lands on your property, they then need to pay you rent and basically, the person who manages to become the biggest mogul... wins! If you have no money, you can mortgage your house or sell it off to make money but generally this happens when you're on a losing streak. There are other bonuses on the board as well such as being awarded $200 monopoly dollars when you pass go or taking a risk with chance, it's all classic monopoly fun. The game makes good use of the touch screen, especially when you throw your dice as you move your finger over them and then rub the screen to shake. It's that easy. 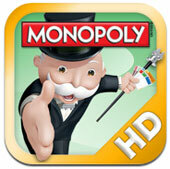 I must admit that the touch screen works perfectly with Monopoly and everything feels just right. Graphically, the game looks far superior on the iPad thanks to the detailed graphics. There is also some basic animations in the game such as your Monopoly avatars moving from point A to B and this animation may be the dog running or a ship moving through the water. 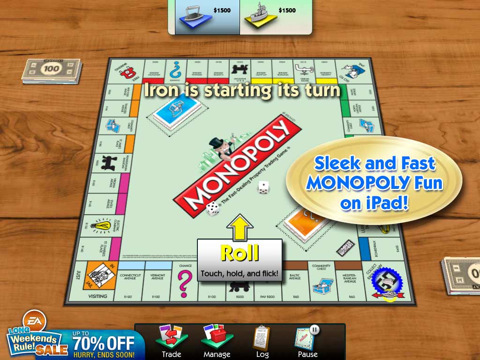 With sharp images, extremely clear text, Monopoly is a very good looking title on the iPad. Match that with some board game type sound effects and a Jazz like soundtrack and everything is bridged perfectly from the board game to the virtual world. The only issue with Monopoly is the soundtrack that does become repetitive unfortunately. 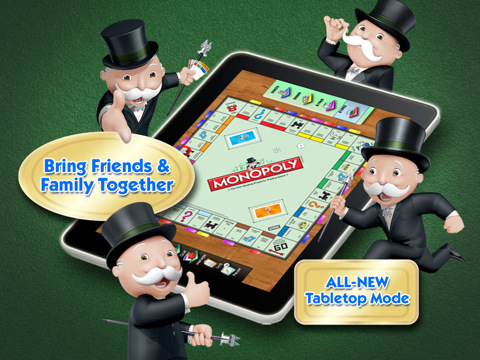 In conclusion, Monopoly for iPad is great with friends and even solo if you want to be captivated by one of the world's classic board games. I'm quite impressed at how well the developers have transferred this premise to the iPad because it's just as good as playing the real game... probably better because you don't have to setup or clean up afterwards.